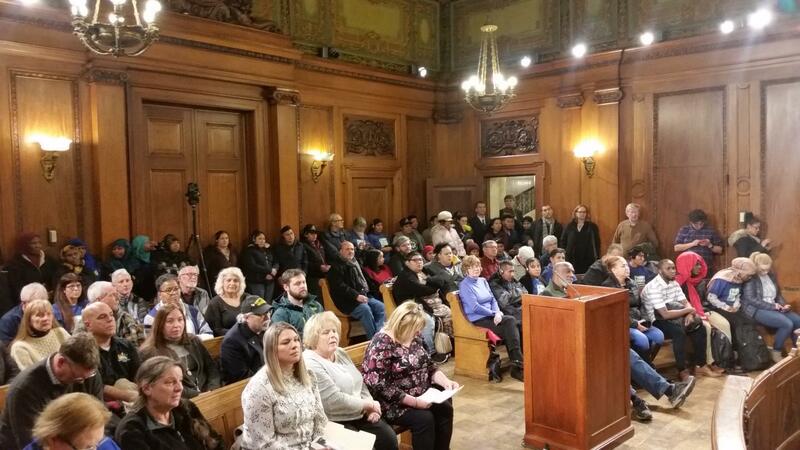 A large audience was present for the Springfield City Council's vote to override Mayor Domenic Sarno's veto of the Welcoming Community Trust ordinance. The ordinance instructs city employees to not make inquiries about a person’s immigration status. It also forbids city officials from targeting with legal action or discriminating against a medical, educational, or faith-based institution that is providing sanctuary to immigrants. Councilor Adam Gomez, the lead sponsor of the ordinance, said final passage means undocumented immigrants living in Springfield should feel free to call the police, or any city agency, if they need help without fear of retaliation. "On the federal level those issues have nothing to do with the ordinance that is being put forward today," said Gomez. Sarno, while saying he supports legal immigration, has long fought against attempts to protect undocumented immigrants living in Springfield. Last year, he ordered an inspection of an apartment at the South Congregational Church where a woman facing deportation to Peru had taken refuge. "Springfield is a safer city tonight," declared Parrish. " At the end of the day, love won over fear." There was applause and cheering when the result of the override vote was announced. The 13-member council needed a two-thirds majority, or nine votes, to override the mayor’s veto. City Councilor Tim Allen cast the only “no” vote on the override. Councilors Ken Shea and Kateri Walsh were absent from Monday night’s meeting. They had both voted against the ordinance when it passed the council on December 17th. The mayor of the largest city in western Massachusetts and the city’s legislative body are on a collision course tonight over the nationally volatile issue of immigration. An undocumented immigrant left the sanctuary of a church in western Massachusetts today to rejoin her family after being given a one-year stay from deportation. City Councilors in Springfield, Massachusetts are poised to vote on a big tax break to support an expansion project by a long-time city-based company. New property tax rates have been set in the largest city in western Massachusetts. A majority of homeowners and businesses in Springfield are likely to see higher bills in the new year.